Provide comfort for the family of Charles Lewis with a meaningful gesture of sympathy. 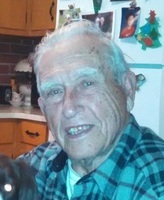 Charles Lewis, 90, of Minoa, passed away peacefully on Wednesday March, 6, 2019 surrounded by his family. Born in Oswego on July 19, 1928, he was the son of Leland and Grace Lewis. He was a graduate of Minoa High School. Charles served in the United States Army. He worked for Fayetteville Manlius Schools for many years. He was an avid fisherman and hunter, and his best days were spent at his camp. He is predeceased by his wife, Lilla; and grandson, Justin Lewis. Surviving are his children, Carmella (Daniel) Farsaci, Sandra (George) Bremner, Chuck (Annmarie) Lewis; grandchildren, Daniel (Amy), Laurie, James (Liz), Geoffrey (Mary), Shelby (John), Joshua (Mary) Courtney; several great grandchildren; sister, Audrey (John) Newmiller; many nephews, nieces and in-laws; and his beloved dog, Penny. Calling hours will be Monday, March 11 from 4 to 7pm at the R.H. Schepp & Son Minoa Chapel, 6530 Schepps Corners Road, Minoa. A funeral service will be Tuesday, March 12 at 10:30am at the funeral home. Burial will be in St. Mary’s Cemetery, Minoa. In lieu of flowers contributions may be made in his memory to St. Jude’s Children's Hospital. Please accept the most heartfelt sympathies of Le Moyne College. We hope the love and memories you will forever hold in your heart bring peace and comfort during this difficult time.